Discover a different view of wildlife along the river with a canoe safari. Swap the 4×4 for a canoe or a kayak for a unique experience which mixes the relaxing pace of the river with an adventurous spirit. When you’re looking into a canoe safari, there are several types to consider in terms of facilities and budget before you make a booking. There are full participation canoe safaris – usually the cheapest – where you’ll take all your gear and provisions in the boats and camp overnight on an island or the mainland beside the river. Typically, all the meals are taken care of by the guide, with the canoeists assisting in camp life by cleaning or fetching water. It’s usually quite rudimentary, with small bow tents or mosquito nets draped over a paddle for your accommodation. However, for the intrepid traveller, these canoe safari experiences offer the most fun, adventure and flexibility. If you need a little more comfort on your safari holiday, look into a backed-up trip. These safaris will involve a crew supporting you as you progress down the river and more luxurious overnight stops at large mobile tented camps. The meals are high quality – as you’d expect from more permanent facilities – and there’s the added advantage of vehicles and walking options for a break from the canoes and the river. You’ll also have one of the best professional guides in Africa helping you make the most of your trip and the wildlife you encounter. 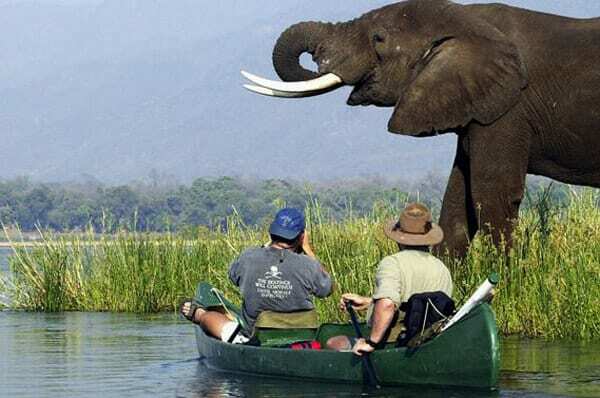 There are also special types of canoe safaris for different groups, such as safaris exclusively for children (led by professional guides), photography canoe safaris and combination walking and canoe trips. For a shorter taste of canoeing experience, some permanent camps also have canoe trails which you can use for just a day or afternoon safari. Be sure to look at the safety record of an operator before making your decision, too. Although cheap trips sound preferable to backpackers and visitors on a budget, the guiding and provisions can vary in standards and it’s very important to be confident about your safety on the water. The best game conditions are during the dry months of late June to mid-November in Africa, but the temperatures soar during October and November – be sure to take extra sun protection for when you’re out on the water! The wet season is also fine for canoe safaris, as the pattern is generally a short storm followed by sunshine and the river is at its quietest. If you pack a poncho for the boat and keep a change of clothes dry for camp, the weather shouldn’t be an obstacle. Some of the best canoe safaris in Africa are centred on the lower Zambezi River – a fantastic waterway that winds through unspoilt landscapes. As well as the magnificent valley scenery and amazing sunsets over the wilderness, you’ll also get the chance to experience great game and birdlife. Canoeists hoping to spot all the big game like hippo, buffalo and elephants won’t be disappointed. In Mozambique, you can experience the magic of the Lugenda River in the little known Niassa Reserve. This beautiful wild reserve in the north of the country is the perfect destination for adventure enthusiasts – you really can get away from it all with a canoe safari here! Walk and paddle your way through a truly unspoilt landscape to see the granite inselbergs and the endangered wild dog. For an extended break, head to the beach for a few days afterwards for a safari with a difference. The legendary Okavango Delta is an unbeatable destination for canoe enthusiasts. Combining amazing wildlife with stunning scenery along the shoreline, the waterway is a highlight for any adventurer looking for a safari with a difference in Africa. The Selinda Spillway to the Linyanti in northern Botswana is one of the best places to explore by boat, with great camping along the way. Unless you’re on a combination walking and canoeing safari, it could be a good idea to book the nights before and after the trip at a hotel or B&B. A late flight or travel connection could result in missing your canoe departure and on the way back, a shower and a bed will probably be the first things on your mind! Pack long-sleeved shirts and a towel to cover up your arms and legs whilst on the river – the sun can be very fierce from the water. Sunglasses and a wide-brimmed hat are also recommended to help combat heat stroke. Sun cream is another essential! Don’t forget that temperatures can drop during the evening, though, going as low as 15 degrees Celsius on the river between May and August. Bring walking shoes for camp and any on foot excursions with a separate pair of rafting sandals for use in the boat. If you’re on a full participation canoe safari, a torch and spare batteries are handy for when you’re on shore at the makeshift camp. Pack any valuables such as a camera in waterproof bags, just in case! Angling enthusiasts can often bring their tackle and equipment for a spot of fishing in the rivers. A lightweight poncho is a good rain cover for canoeists, especially between November and March. Don’t over pack, though – limit your luggage to less than 10kg as you’ll be carrying everything in the canoes with you on a full participation trip.